Here is a quick dinner recipe using a few simple ingredients. Instead of taking the sausage out of the casing, I roast the sausage whole then cut it into chunks before adding them. They stay nice and juicy that way. This hearty ragout is equally good tossed with pasta or as a sandwich in a torpedo roll. I used whole wheat spaghetti because I happened to have it on hand. I like Muir Glen canned tomatoes because the inside of the cans are coated so the tomatoes don’t taste metallic. Pre-heat oven to 375°F. (I like to use the a toaster oven – it doesn’t need pre-heating). Cut a few slits in the casings of the sausage and place them in one layer on a sheet tray. Roast them for about 10 minutes, turning them after 5 minutes, until they are just cooked through and slightly browned. Cook spaghetti according to package directions. Drain and coat lightly with olive oil. While the sausage is roasting and spaghetti is cooking, place a dutch oven or saucepan over medium heat. Coat the bottom with oil and saute the onions, peppers and garlic until the onions are transparent and the peppers are soft, about 5-10 minutes. When the sausages are cooked, cut them into bite sized chunks and add them and their juices to the vegetables. Toss together then add the wine. Continue to cook over medium heat 2-3 minutes until most of the wine is evaporated. Add the diced tomatoes and herbs and simmer for about 15 minutes. Season to taste with salt & pepper and finish with olive oil. Toss with spaghetti and enjoy. Variation: Bored of your basic sausage and peppers? 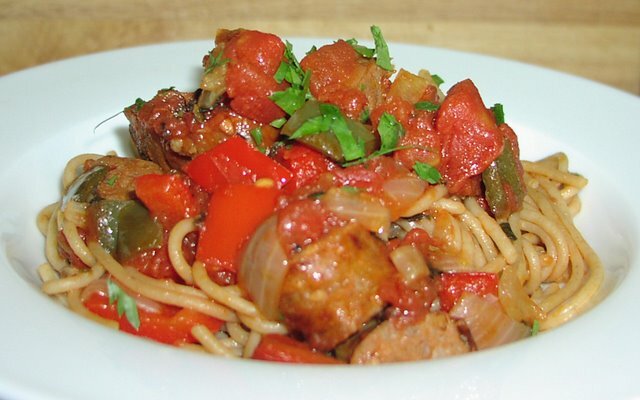 Try making Sausage Ragout with Fennel and Rosemary. Instead of bell peppers, use a fennel bulb, thinly sliced or finely diced. Tie a few strips of orange zest with the thyme and bay leaf, and use freshly chopped rosemary leaves instead of oregano.